I was chatting with a buddy of mine the yesterday and he was like "go check out this band The Lytics, Andrew Sannie's in it". This probably means nothing to a lot of readers but he was that kid in high school, a couple years younger, who not only had good steez but was one of those genuinely nice kids. So you can't help and get excited for these guys when you hear them getting radio play on the cities radio stations. The Lytics are, safe to say, one of the up and coming, next big thing, hip-hop groups in Canada. The group, consisting of Munga, A-Nice, Ashy and DJ Action Rick, have been together since 2003. They released their first EP in 2008 which lead to much success which has lead them to being the opening acts for Naughty by Nature. The trio sites A Tribe Called Quest, Mos Def, Souls of Mischief, Arrested Development, The Pharcyde, and Poor Righteous Teachers as musical influences. 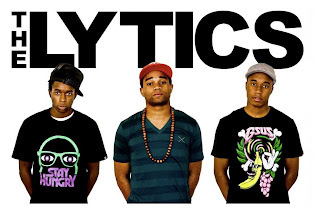 Even more refreshing is the Lytics approach - maintaining a positive outlook, both in their music and in their lives. You can download The Big City Soundgirl ringtone on their myspace free of charge. *the widget that was playing the Big City Soundgirl track from verbnation is temporarily out of order. I will toss it back up here as soon as I can. Until then check out the myspace for the track.